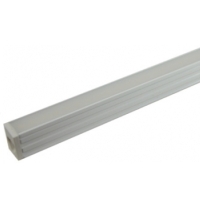 The Maxlite LED LightBar is dimmable and provides even illumination throughout the 12 inch length of the LightBar. The built-in drivers allow you to snap sections together with a simple plastic connector to make a run of any length. Each LightBar includes a 4 inch corner connector jumper, a bar to bar joiner, quick clip mounting brackets and screws, and a alternative mounting option of double sided tape. Dimensions: 12" x 3/4" x 7/8"